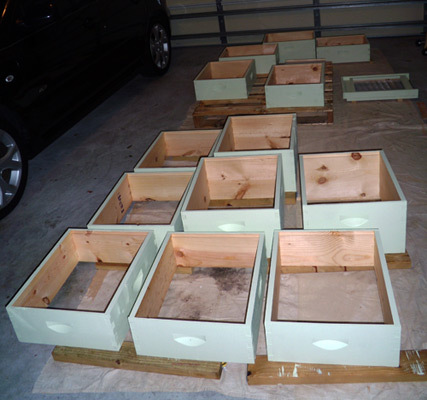 So my husband and I spent some time this weekend assembling and painting new hive bodies. 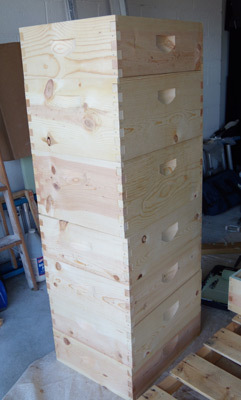 We buy our hive bodies unpainted and unassembled to keep costs down. We use 9 5/8″ deep bodies for the brood chambers and 6 5/8″ shallow supers for honey. Assembled and ready for paint. More hive bodies waiting for paint. Instead of using plain white, I like to add a little color to my hives. I’m using Glidden exterior water-based paint in a satin finish, color called Pistachio Ice Cream. White or light pastel colors are best so that the hives don’t get too hot sitting in the sun. All done for now. 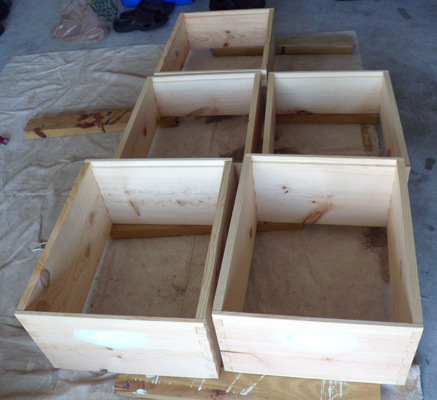 More hives are on the way.